Adrian Beltre is unarguably among baseball’s purest sources of joy and delight. But umpire Gerry Davis was not too delighted by Beltre’s response tonight when he told the veteran to get in the on-deck circle while he was, uh, on deck. Beltre simply dragged the on-deck circle to where he was already standing—a few feet away—and Davis reacted by ejecting him. Let the record show that the Official Baseball Rules do not specifically ban anyone from moving the on-deck circle, though they do offer general guidelines for its placement on the field, which would not seem to have been violated by Beltre moving it all of a couple of feet here. (The rules also call it a “next batter’s box,” which, what the hell?) 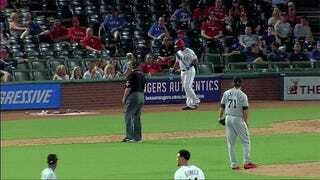 Beltre’s only crime here would appear to be trying to have a bit of fun during a blowout. The horror.